Some consider the straight sword to be the most elegant weapon in the Kung Fu arsenal. Here are books on this and related subjects. As you will note, there is a preponderance of T'ai Chi straight sword, that being one of the most popular weapons in the art. Click on the individual pictures to see if there is an larger version. NOTE: For more detailed view, click each picture. If you are interested in learing a drunken sword you could certainly do worse than this routne created by champion player Sun RongYi. This is a good representative because the basic structure of a decent sword set is in tact without having abandonned the basics. My advice for learning is to take it in three stages. Memorize the set without the rolls and ground work (these are, cleverly, always modular anyway so they can be removed without significantly altering the form). Then add the drunken "flavor." Then replace the ground work if wanted. $17.95 54 pages, English/Chinese text, illustrations and accompanying VCD showing exercises also with minimal English/Chinese narration. The extra length of the blade for two-handed sword is compensated by the additional length of the handle which also allows a double grip. The movements for this weapon often alternate between the single and double grip. This is a good weapon if you are familiar enough with straight sword and the so-called “hidden sword” of the correct left hand position to make the transition to double holding. This form is comprised of 49 movements with many spins, turns and off-angle techniques. This can be a good practice weapon for wrist strength and a great performance weapon if handled well. Overall, another beautiful form with this two-handed sword. 54 pages, English/Chinese text, illustrations and accompanying VCD showing form also with minimal English/Chinese narration. The sword is said to take the most time to master in Kung Fu. Then of course there is the Paired or Double Sword. Add to that the very difficult to control long tassles and you have a formula for trouble. This 26 movement set gives a good introduction to the basics and requirements of this weapon. Double straight sword is often associated with women performers, because female practitioners generally demonstrate a greater control of symmetrical movement. In the case of the Long Tasseled Swords this idea of symmetry is expanded to include not only the two swords but the front and back of each sword which manifests in the control of the tassels. This weapon becomes the ultimate in graceful, controlled and fluid actions. This truly lives up to its title as a “complete” presentation of the art of the sword. The manual starts with basic warm ups, progresses through static postures to individual movements and finally to sparring. The best thing about the writing, though, is that it continually circles back to the meaning and the cultural background of the art. All of Kung Fu's funny stances and stretched out limbs make one hell of a lot more sense in the context of weapons training. These would allow a practitioner to immediately adapt to either empty hand or weapons at a moment's notice. 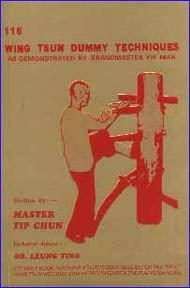 Weapons training, in Kung Fu history, often took precedence over empty hand training which was sometimes seen only as a foundational method for weapons training. On a higher level there are many special skills which people can use in empty handed combat which originated in the weapons division of the art. Fencing will allow people to see these presently weakened connections. This book is an important step not only in preserving a great tradition but also a contribution to setting a standard. As weapons sparring progresses we must use the hard-won lessons of hundreds of years of experience to keep the art from disintegrating into smashing one another with plastic poles. Real movements, well explained, with both the Dragon and the Tiger sides shown, footwork clarified and strategy revealed. Not only important, but great fun! 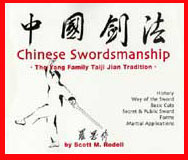 Written by a student of the famous sword master Li Jing Lin, this is a historic document on the use of the sword. All the methods of the sword are described with a single accompanying picture. The original text, though a valuable historic document, is very light on actual information with, for instance, the two person set described with no accompanying pictures. Coming as it did from the teachings of Li Jing Lin this should be a major source of information but, through no fault of translators, we find it important more for its documentary than informational content. Almost half the book is commentary added by Chang Wu Na to the texts and, while some of it does indeed clarify, much of it is explained in terms almost as difficult to fathom as the original. All this raises an interesting point: though the period in which this book was written was one of the high points in history for recording information on Chinese martial arts, we are right now living in the Golden Age of this venture. For instance, consider the book above, Jason Tsou's Jianshu. The presentation of information for clarity, completeness, illustration and organization is unquestionably of very high quality. Many of the old texts, which we love, come from impeccable sources with, admittedly, quite 'peccable' vehicles of communication. This new book on Test Cutting by sword enthusiast and teacher, Scott Rodell, is one of the fullest explanations in English of the practice of Test Cutting or cutting through objects to test your skill and the quality your blade. He covers a lot of ground here including many words on safety, how to built test equipment, how to make sure you don't kill someone, what objects to cut, the basic principles of cutting, historical background on the practice and the art of the sword including battlefield conditions and much more. Though the book has the occasional typo (we should tlak) and we think it could use even fuller discussions on almost every topic: this is one of the first texts of its kind and must be on the shelf of anyone with an interest in the blade. We encourage people to buy and read this text. We strongly feel that the actual testing should not be done without supervision or at least a willing witness. Not play time. Long time teacher of Taiji, Scott Rodell, has an authentic enthusiasm for this subject. This oversized book contains a lot of photographs and historical notes on the jian (Chinese sword), Way of the Sword, basic cuts, Forms and Martial applications. He presents what he calls the "public" Yang style sword and another version from the branch he has studied called Mi Chuan or Secret Teachings. 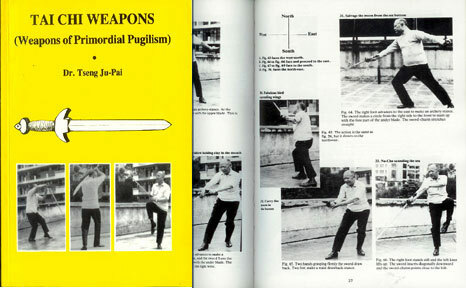 We find some of Mr. Rodell's ideas about the sword to be still developing but we are delighted to see books like this where subjects in Kung Fu which have been taken so lightly for so long are now beginning to attract a deeper attention. Some of his notes on the sword in battlefield conditions are very interesting and his knowledge of the weapon itself is thorough with many insights into the practical application of the art and the instrument in real battlefield condition. He has also produced a DVD as a companion piece . will let you know if it comes back. Said to be the first complete English language introduction to Tai Chi sword (an arguable statement) this is nonetheless a serious and well-written text on the subject. It sees itself, something we commend, as telling important aspects of swordsmanship for ANY martial stylist. It is not only gives an introductory set for the straight sword but deals with holding the weapon, the anatomy of the sword, usage, vocabulary and the sword's special "energies". Definitely a text for those interested in this classic weapon. A cut above most other books on the subject. 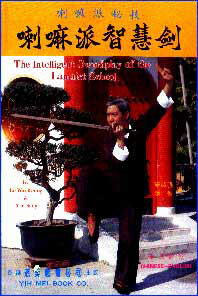 The author, Zhang Yun, is a student of the famed Wu Style T'ai Chi teacher Wang Pei Sheng. He has been studying martial arts for over 25 years and presently teaches in Princeton, New Jersey. This is a sword set from the LaMa (also known as Hop Gar or Tibetan White Crane Style). This particular set is from the LaMa branch of the art and shows the movements annotated in both Chinese and English. A nice set in an inexpensive edition. An intelligently written and informative book. While not exhaustive it gives good solid information and some new insights. 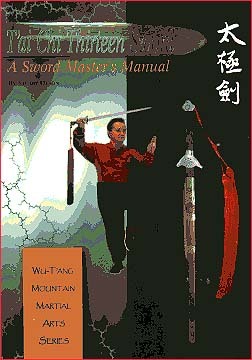 A basic book on Chinese sword practice with a set comprised of 130 movements. English-Chinese text (en face, practice your Chinese reading while learning the set!) explains the actions often giving twin camera views. Color photos section in the front. Clear instructions with decent photography. Not only are the pictures and poses clear and succinctly explained, but the introduction gives some background on the "13 methods" of T'ai Chi swords practice. Definitely our least expensive book on the subject and in both languages! 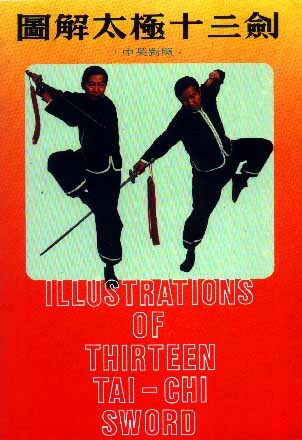 "T'ai Chi Thirteen Sword is the first serious treatment of T'ai Chi Sword methods and philosophy in English. 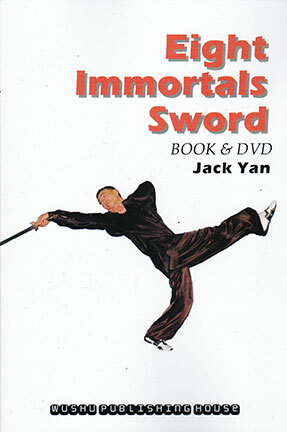 Although Sword is usually just considered an aspect of T'ai Chi Chuan, this book clearly shows that Sword practice is not only a complete system but an art in and of itself, and need not be trained in conjunction with any other T'ai Chi exercise. " Pictorial comparison of master Chen WeiMing, Hsiung Yang Ho and T. T. Liang performing sword. For the Record: Stuart Olson's books are good. We look with askance at his continued need to claim "the first serious" and "secret" and all this, but the information is there and well designed. 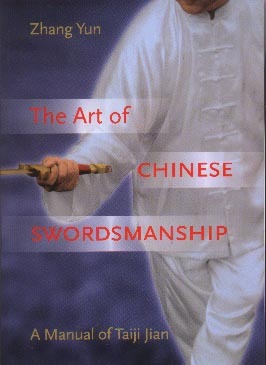 This is one of the first books ever written in English on the subject of Tai Chi weapons. It comes from Dr. Tseng Ju Pai. He originally wrote it in 1976 and published it through the estimable Crompton Ltd. in 1982. There are some interesting notes and, since Dr. Tseng was translating from the Chinese directly and was obviously educated, he often used terms which are different from the accepted jargon. Thus Chi is "intrinsic energy" and a good phrase it is. Photo breakdowns are given of the Yang style Tai Chi sword and saber. There are short, basics sections on Tai Chi Spear and the even more rare Tai Chi Halberd (Ge). Tseng appears to have studied from Yang Chen Fu. This is a combination of two versions of the same Ba Gua sword set. The first is very close to a version Joseph Crandall learned from Zhang Jie one of Liu Xing Han's students. The second, by Huang Xin, a grand-student of Liu Xing Han,is from a series of articles in Wu Hun magazine. Each set runs, of course, to 64 moves. In this case, though the reproduction on the photographs is not great, there is more breakdown in the photographic second section of the text than in the illustrated first section. The names of the moves are correlated so the illos and photos aid one another .